The little town of Ronda is in my opinion one of the best day trip destinations in the south of Spain. It is strategically located and can be reached easily from Malaga, Seville and the Costa del Sol. There are many great things to see in Ronda and the attractions can be best explored on a self-guided walking tour. I have visited Ronda many times, and each time I have fallen in love with it a little bit more. From the Puente Nuevo – the New Bridge – to a magnificent bullring and ancient Moorish palaces, there are many things to see in Ronda. The following self-guided walking tour is a great way to discover some of Ronda’s best known sights as well as some unknown corners. I will also add some recommended Ronda hotels in case you are planning to stay overnight as well as guided day tours that you might want to join for some more background information. Disclaimer: This post may include affiliate links. Ronda, Spain is a popular day trip destination in Andalusia thanks to its spectacular setting and views. This map is a rough indicator of the locations of attractions in Ronda and where to find them. I made sure that the walking tour would come full circle, this way you can start and finish wherever you like. In some places, you are invited to explore further, time permitting. 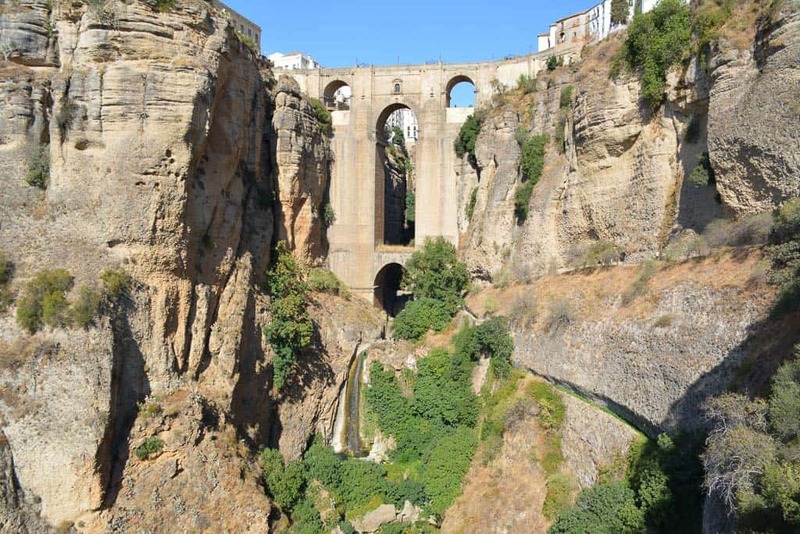 Ronda’s main feature is the deep Tajo gorge which is crossed by three bridges. There are many viewpoints as well as pathways leading to the bottom of the gorge. Ronda is an ancient Spanish city that is located on two mountains with a deep gorge in the middle. While overall picturesque it is the southern part that is slightly older and shows some typical features of a Moorish settlement. The city’s two parts are connected by three bridges that cross the El Tajo Gorge and the Guadalevín River. These are the New Bridge (Puente Nuevo) which is the most spectacular of the three, the Puente Viejo bridge (which means Old Bridge even though it’s not the oldest bridge of Ronda), and the Bridge of San Miguel (also known as Roman or Arab Bridge). You will see all three of these on our walk. Besides the amazing location and the great views of the countryside, Ronda is home to a number of palaces, museums and historic buildings. Again, on this walking tour you get to sample some of these. Ronda is famous as the birthplace of Spanish bullfighting. It is an important part of the Andalusian culture which is best explored at the historic bullring. We start our Ronda walking tour at the Bullfighting Ring in the newer part of town. However, as said before you can just pick any of the attractions and start from there if it’s more convenient for you. The Bullring, or Plaza de Toros, is an important part of any Spanish city, even though bullfights are widely abolished in Spain now. The bullring in Ronda is legendary which is why you would want to include it on your visit to the city. Built in the 18th century, it is the oldest bullfighting arena in Spain. There are some beautiful Neoclassical elements in the design that you can check out when taking a tour. Unlike many other bullrings in Spain, the one in Ronda has all seats under cover. You can choose to have a look inside for around 6 EUR or simply admire the beautiful entrance gate and the bullfighter statue of Pedro Romero outside. The tourist office next door may provide you with a paper map to help with orientation. 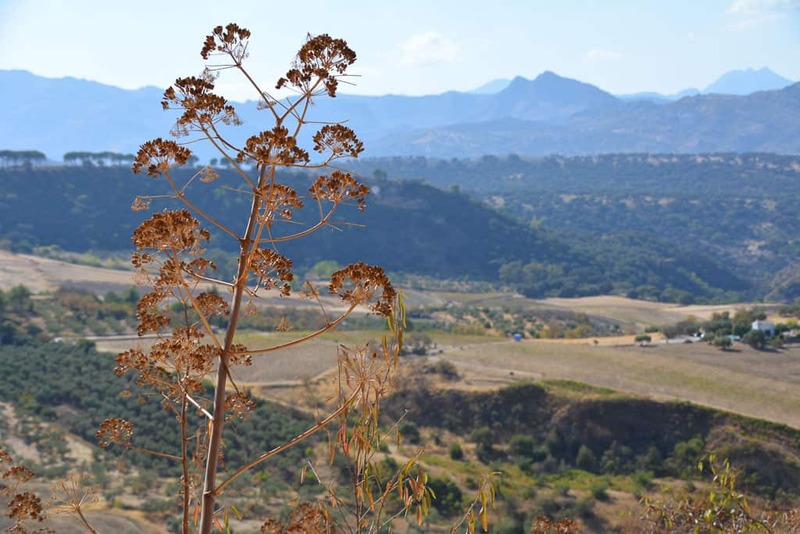 Great views of the sun-kissed Spanish landscape can be head from Ronda. Start at the Alameda park and then follow the rim to the first bridge. From the Ronda Bullring find your way to the edge of town just behind the little park called Alameda de Tajo. The Mirador de Ronda is a beautiful lookout point from which you can see the lower lying parts of the countryside, the forests, farms and mountains. It’s a breathtaking sight and surely one you will not easily forget. Scroll to the top of this post to see a picture of it. Take some photos, then head left, following the rim (ignore the map above for this stretch of the walk, Google doesn’t recognise the fact that there is a footpath). Continue your way underneath the Parador hotel, turn the corner and enjoy the views of the beautiful Puente Nuevo and the steep El Tajo Canyon. Puente Nuevo is best viewed from the pathway leading down to the bottom of the gorge. This way you can even see the small waterfall under the bridge. The Puente Nuevo is Ronda’s New Bridge (even though it is already 200 years ago). It is an impressive feat of engineering, crossing the steep gorge at a height of almost 100 metres. No wonder it is is Ronda’s most famous landmark. On this walking tour we will cross the bridge to get to the older part of the town, however if you are keen you can also have a quick look inside. The entrance to the Puente Nuevo is cheap and will give you access to the room underneath the bridge where you can see a small balcony. There is a not very interesting exhibition in Spanish about the construction of the bridge and the use of the room for locking up political prisoners during the Spanish Civil War. The booklet you receive with your ticket will be in English. When you are done, get across the bridge to the other side. If you want you can get down to the bottom of the gorge. This gives you a better position for taking photos. Beware though that the path is steep and oftentimes slippery, and strenuous in summer. At least try to get halfway to get the best view of the bridge and the little waterfall underneath. Start at Mirador de María Auxiliadora, a small park in Calle Tenorio. The beautiful garden of Palacio de Mondragón is the highlight of this small city museum. In an old Moorish palace from the 14th century you will find Ronda’s Municipal Museum, Palacio de Mondragón. The entrance fees are cheap and I think you should really have a look inside since the palace is a fine example of Andalusian building design. It’s not overly huge but has nice courtyards, balconies, tiled walls, and terraces. The gardens in particular are gorgeous and offer great views of the countryside and a nice cool breeze. Follow the route as indicated on the map to get some good insights into the fabric of Ronda’s oldest quarter. Soak up the atmosphere of quiet cobblestones streets, grand entrances of ancient palaces, and whitewashed walls. One of Ronda’s prettiest squares, Plaza Duquesa de Parcent, is also on the way, bordered by the church of Iglesia de Santa María la Mayor. Strange objects make up the major part of the exhibition at Museo Lara. An off-the-beaten path attraction that I am happy to recommend. Our next stop on the walking tour is definitely optional, but I would strongly recommend you have a look inside. Museo Lara is probably one of the most unusual museums I have seen so far. The exhibition is a curious mix of practical things from the past, beautiful things from the past and torture instruments from the Inquisition. The collection includes some unusual typewriters, six-barrelled pistols, delicate prayer books, and fine measuring instruments from the early days of science. The torture objects and witchcraft collection in the basement are clearly there for effect, and probably not recommendable for families with young children. However, if you do make it to the basement, check out the deep well in one corner of the room. The water mine is a deep shaft with more than 200 steps that leads to the bottom of the gorge. From here you can see the crystal clear water of the river as well as the houses of the village. From Museo Lara find your way to another of Ronda’s beautiful palaces, Casa del Rey Moro. While the main house remains under construction, your entrance fees will allow you to see the hanging gardens and the water mine. While the gardens are looking a bit sad and neglected you still get some unique views of the narrow gorge from here. You will need a certain degree of fitness to get down the 230 steps of the water mine (and up again). But in my view it’s well worth the effort. Make sure you wear sturdy footwear as the inside of the water mine is steep, dark and slippery. While you get down to the bottom of the gorge imagine how slaves would have had to make the trip several times a day, skin bags in hand, to get water from the river. The Arab Baths are among the top sights to see in Ronda. You can see the remains clearly from the Old Bridge, the Puente Viejo. Your next stop on your walk will be the Public Baths that were once erected by the Moors. They are a fine example of Moorish design that borrowed freely from the Romans. Constructed in the 13th and 14th centuries, they are today the best preserved Arab Baths in Spain. Look at the beautiful star-shaped openings in the ceiling of the three rooms that let in the light in the most beautiful way! The water was brought into the building straight from the river with a water wheel. Getting to the Arab Baths involves some steep descents and ascents, but you will see that it is worth it. If you are less interested in archaeology and history, you can still see the structures from above as you stop at the Puente Viejo which is coming up next. The Old Bridge may not be the prettiest bridge in Ronda but it comes with great views to both sides and is traffic-free. Ironically, the Puente Viejo is not the oldest bridge in Ronda (the oldest bridge, Roman Bridge, can be seen from the Puente Viejo though). It may not be the most pretty bridge but it is free of traffic and much more relaxing to walk than the Puente Nuevo. The bridge is from the 16th or 17th century and offers some great views to both sides. On the one side you will see the Arab Baths and the Roman Bridge, on the other side you can look deep into the gorge, almost all the way to the New Bridge. You will see the water of the river below your feet, a refreshing sight on a hot Andalusian day. Views of the gorge and the river from Puente Viejo. Follow the road as indicated in the map to return to your starting point. This concludes this one day walking tour of Ronda. There are of course many more things to do in Ronda but these points of interest will give you the essence. Chances are that you will be staying in other cities in Andalusia such as the Costa del Sol or Seville. These recommended tours include pick up and transport to Ronda as well as some fun activities! The following links are affiliate links which means that I will receive a small commission if you decide to make a booking. From Seville: Ronda and Other White Villages Full Day Tour Including Visit to Museum of Wine -> Click here for rates and details. From Costa del Sol: Full Day Ronda Tour Including Wine Tasting at a Local Winery -> Click here for rates and details. 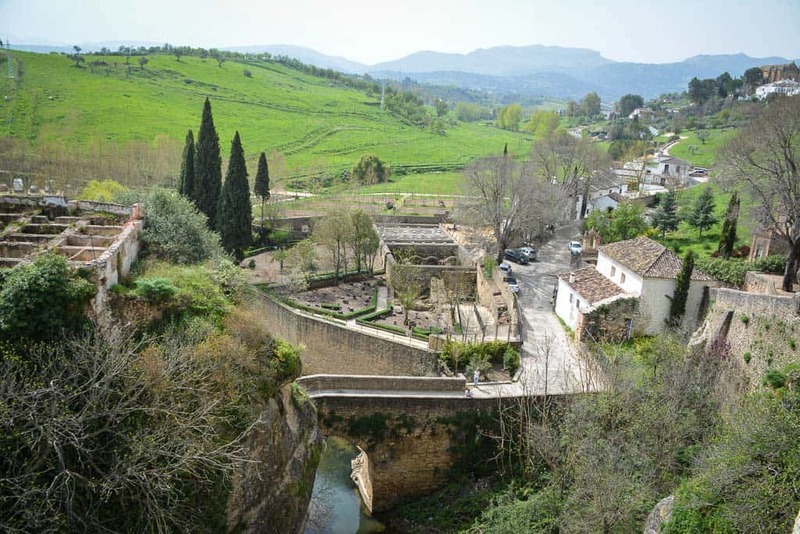 From Seville: Private Tour to Ronda via Sierra de la Grazalema -> Click here for rates and details. The following hotels in Ronda receive raving reviews and are very popular with international visitors. Please note that the links in this list are affiliate links with Booking.com. This means that I will receive a small commission if you decide to place a booking with any of these hotels. Thank you. Hotel Catalonia Ronda: Popular four star rated hotel with well equipped and elegant rooms. Centrally located just across the bullring, perfectly suited for couples, and with own parking facilities. Breakfast buffet in the morning. Click here to check rates, photos and reviews. Boabdil Guesthouse: This small hotel is a renovated Andalusian house with lots of original features. 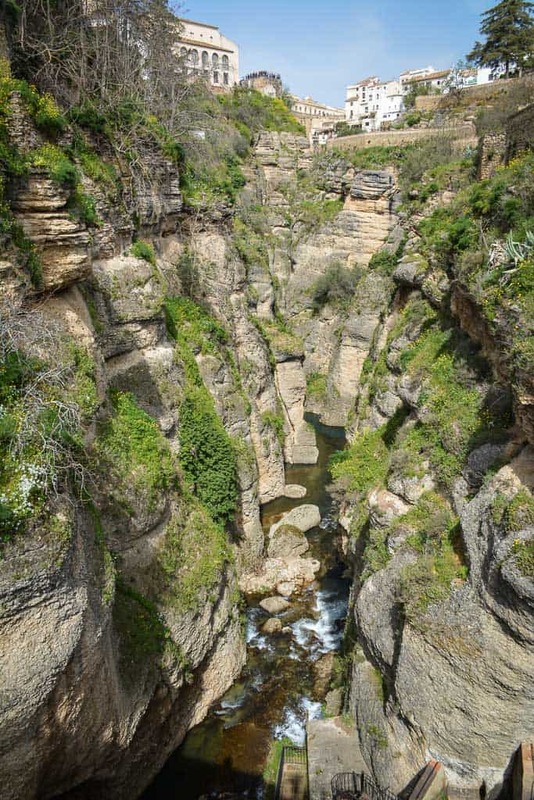 It is located in a quiet part of Ronda’s old town, just steps from the gorge. Great value for money. Click here to check rates, photos and reviews. Catalonia Reina Victoria: This wellness & spa hotel overlooks the gorge and offers an outdoor pool, a spa, a beautiful garden and a restaurant with panoramic views. There are triple rooms available for small families. Check here for rates, photos and reviews. Ronda is a good place to see some beautiful old Moorish architecture, just like here at the Palacio de Mondragón.